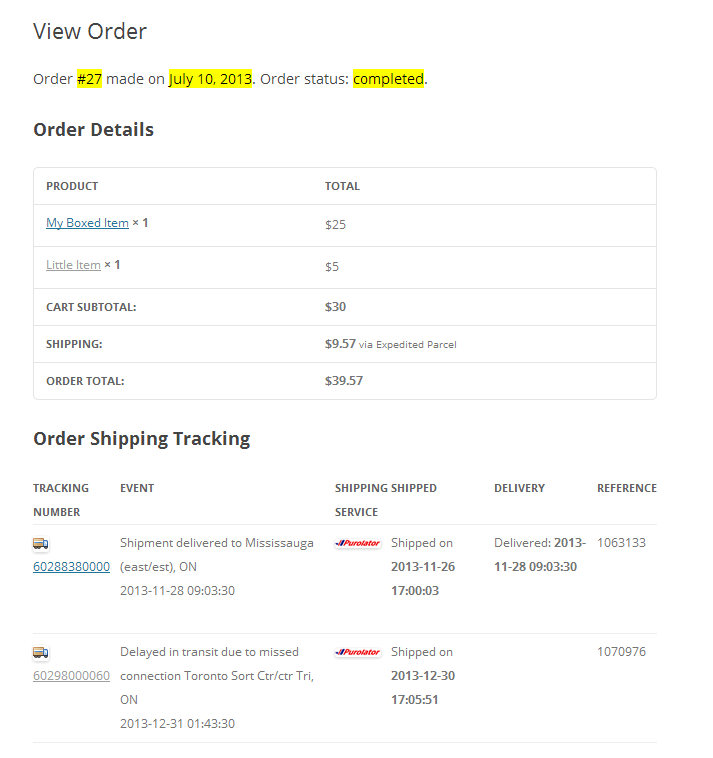 This Purolator Shipping Plugin for WooCommerce provides integration with Purolator Webservices and your WooCommerce website. It is able to provide live shipping rates directly to your customers in their shopping cart as well as at checkout. It, also provides up-to-date package information from Purolator’s Parcel Tracking service. This plugin is fully bilingual in English and Français (French) and is compatible with WPML, a multilingual plugin for Wordpress. It can be used to ship within Canada as well as Worldwide. Package Tracking is available when you enter the PIN (Parcel Identification Number) or Tracking Number into the customers order details. 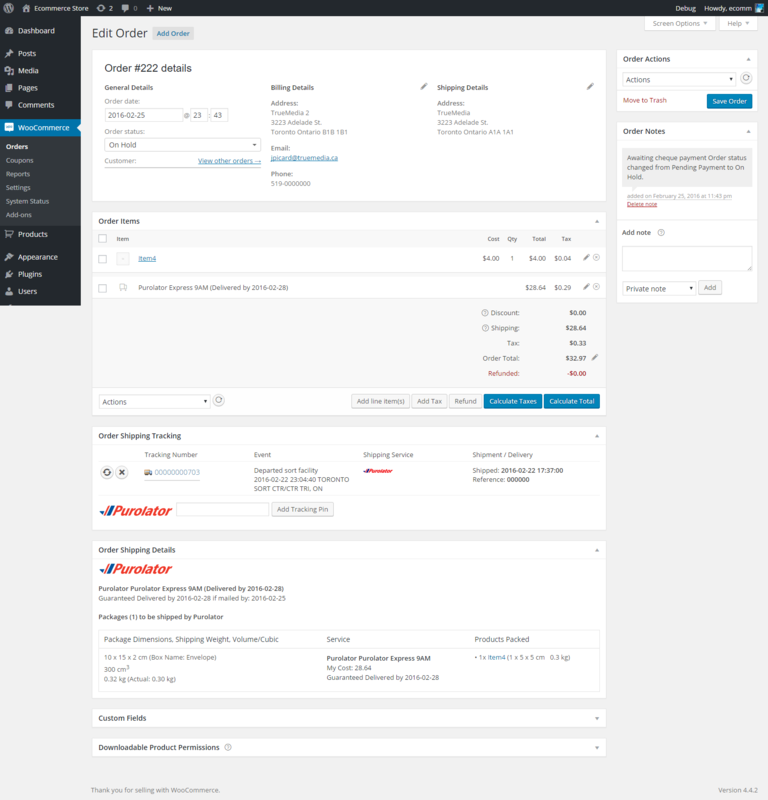 This plugin will automatically look up the most recent and up to date event information available for your order from Purolator on a daily basis. You can set an automatic email notification to be sent to your customer when the package is mailed or delivered. The tracking information can be set to allow your customer to receive up to date information on their order either as an email notification and/or at your customer order page. 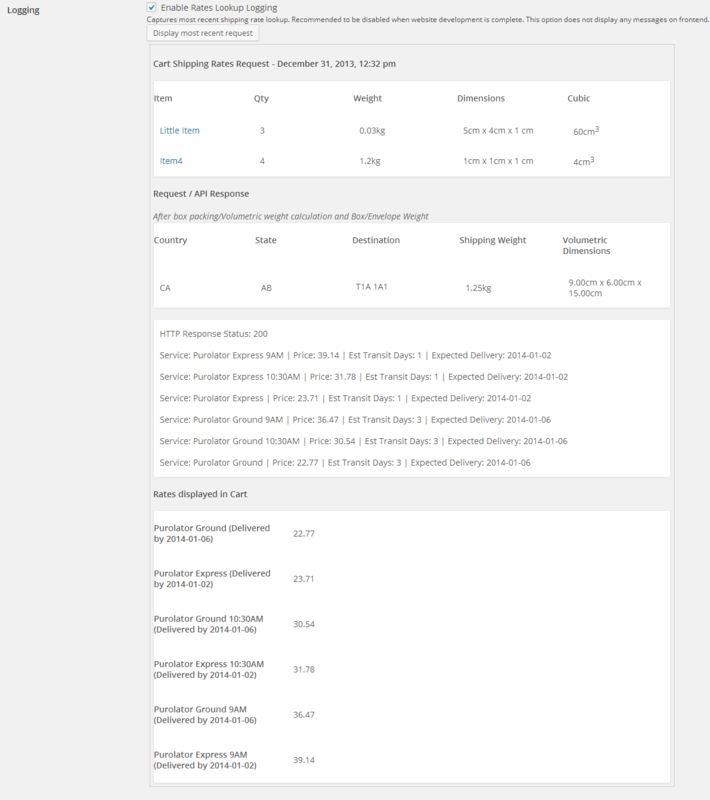 This shipping plugin uses the product’s weight and dimensions to calculate the most accurate shipping rates. For the rates to work, product weight is required but product dimensions are optional. 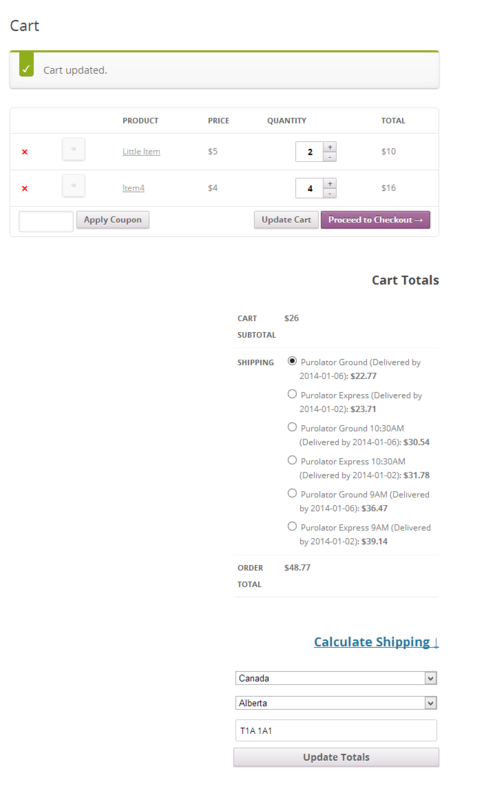 The shipping cost can be calculated with boxes, if configured. If desired there is the option to add a mark-up rate to shipping charges. You are able to choose which services from Purolator you want to offer your customer (ie. Purolator Ground, Purolator Express, Purolator Express 9AM, etc). There is also an option available to add additional handling time if needed. The shipping charges will be calculated and displayed using current and live rates directly from Purolator. An additional feature gives you the option to set up Flat Rates; which gives you the ability to set a flat rate for standard envelopes or parcels that you use for shipping. 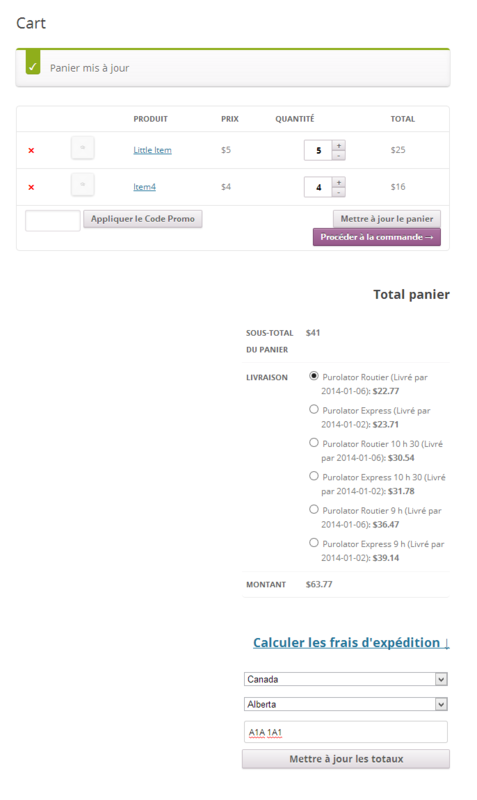 Shipping rates and information from Purolator can be shown in English or Français (French). This is set by your Wordpress installation or WPML language selection. The plugin includes a language file for French (fr_FR), which provides full French translation for all admin screens and labels. Note: Support communication and documentation is currently only in English. 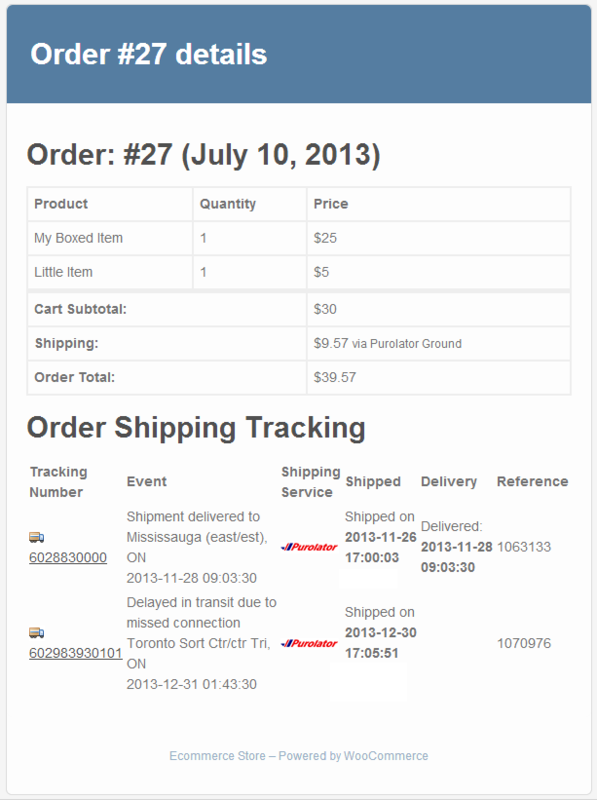 Updated to accommodate response times from Purolator webservice. Fixed packing issue related to dimensions, Optimized box selection. Added feature: Exchange Rate (to make it more straightforward than using Margin for rates). Code improvements, more data and improved layout for Rates lookup logging. New Feature: Settings area has now been organized into Tabs. New Feature: Multiple warehouses. You can now define more than one shipping origin for rates lookup and shipments. It uses geolocation when determining the closest shipment point to the destination postal code. Many other code improvements have been included in this version. More error checking and handling. 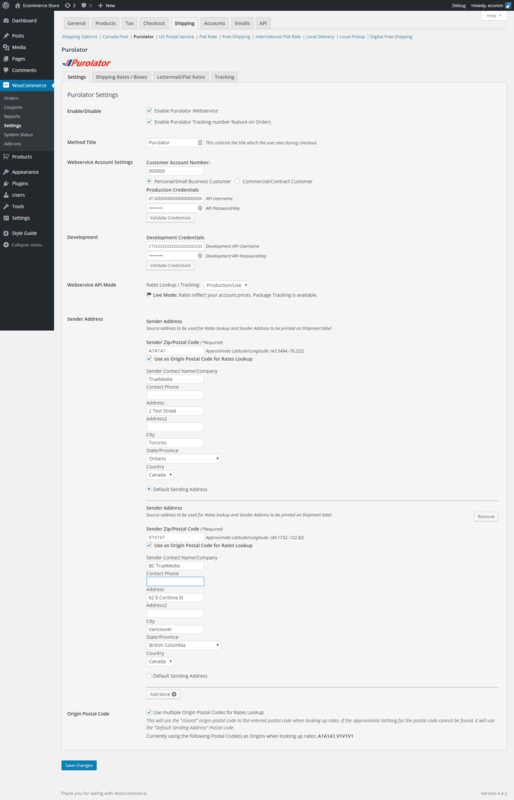 Minor update for Wordpress 4.1 support. Minor update to margin feature. Updated to support PackageTypes and additional Parcel Services. Rates are are sorted by cost from lowest to highest (ascending).